Be sure to read my blog entry ‘On Seamless Conversion’, as this entry is intended to be an example of what I discussed there. This is example 2 of 6. The Minotaur Shaman (a.k.a. Bull-Ogre Butcher or Firebelly), is an example of a seamless conversion on the model level, as well as the army level. 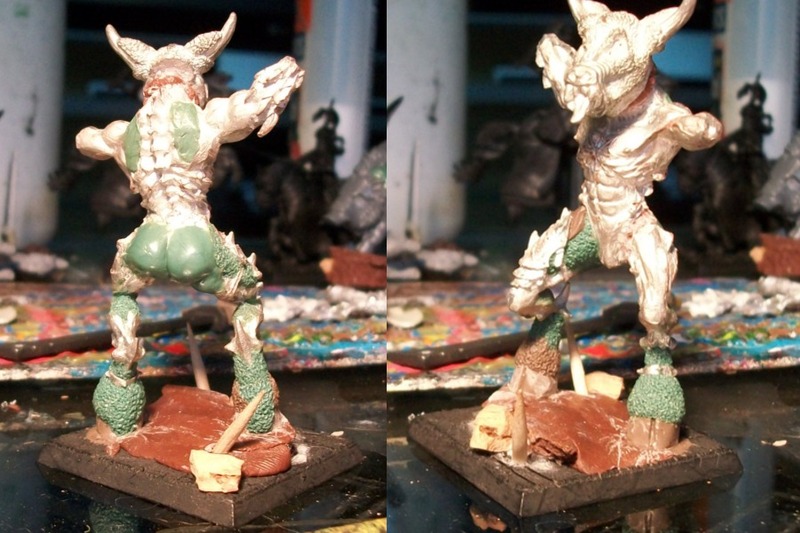 He’s built from the Belakor body, a metal GW minotaur head, GreenStuff, and some bitz from my bitz bin. My goal with this conversion was to create a unique shaman model, in the same style as the metal GW minotaurs. I searched for quite a while before finding a model to base the conversion on. I didn’t want to use an old metal minotaur body or arms, because I wanted something different than most of the rest of the models in the army. I dug through old GW miniature catalogs, and various online resources; before finally looking in my own box-full-of-models in the closet. When I saw the Belakor kit in there, I knew that was the one. From there, I picked an interesting looking metal GW minotaur head. I knew I was going to be covering most of it over in putty anyways, so it didn’t matter that other models in the army would have that same head. I chose to use a stock head because it would lend that perfect minotaur feel that the rest of the army had. The staff is a bit from a model that I bought way back in 2005. I bought it to use as part of a Bray Shaman conversion when I first started building Beastmen, but it ended up being way too big and heavy for a Bray Shaman model on a 25mm base. I have no idea which model that bit originally came from (it was definitely not a GW model), but I knew that I wanted to include it from the first moment I conceived of doing a minotaur shaman. The big challenge with this conversion was making the Belakor model blend seamlessly into an army of minotaur. It has a very different look than the minotaur do. One thing that was obvious was that it needed hooves instead of clawed feet. Some of the metal GW minotaur models come stock with feet, and I always cut them off first thing to be replaced with GreenStuff hooves. The Belakor model was very much hairless, whereas the minotaur are rather furry. That was another obvious way to tie the model into the theme. The cloth draped over the head was a way to really separate this model from the bulk of the minotaur-based army. No other minotaur model has anything like it, so he stands out. The idea was taken from GW’s Bestigor chariot rider. This addition to the model also had the benefit of helping to tie the model into the greater Beastmen theme of the army. Lastly were the little extras. I gave him a pouch in the same style as I have given many of the other minotaur in the army. I added gems (to be later painted green) to his belt and wrist. I’ve given small items of similar color to other models in the force. I am very happy with the result of this one. He matches the rest of the models in the army very well, and there really isn’t anything that I would change about how he turned out. Sweet model, you got some skills on you there, he turned out really great. I have to agree with the Rodge though I just envision him wearing "KISS" boots! Love these articles, keep em coming. I'm snagging the Belakor idea for a future project also, good looking out!